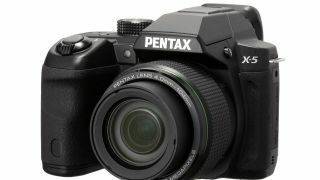 Pentax has lifted the lid on its new X-5 camera, which arrives packing a rather impressive 26x optical zoom setting. The "powerful high-magnification optical 26X super-telephoto zoom lens" is undoubtedly the headline feature on this bridge camera, which also brings 16-megapixel still shots. Powered by AA batteries, the X-5 has an equivalent focal length of 22.3-580mm and a backllit-illuminated CMOS sensor that promises low-noise imagery at ISO settings of up to 6400. In contrast to the insanely large optical zoom offering, there's also a Macro mode which allows clear and crisp shots from a mighty-close 0.4-inches away. We'll have to put that claim to the test, for sure. It'll also fire-off up to 10 images per second. "The new X-5 features classic PENTAX styling. It is the ideal compact travel companion for photo enthusiasts who want a digital camera with them wherever they go that's capable of taking every type of image from gorgeous portraits, to scenic landscapes to extreme close-ups and more," said John Carlson, Sr. Manager of Sales and Marketing, at Pentax. The X-5 can also shoot video in full HD 1080p at 30 frames per second and will record in the H.264 format. It has an electronic viewfinder and a tilt-able 3.0-inch LCD screen on the rear of the device. The device is launching next month for $279.99 (£175).